It’s probably time to record a goose update. Between the gander and hubby and myself, we’ve been babysitting “our” nesting momma goose vigilantly throughout her 28+ days incubating her eggs. Yesterday she hatched!!!! I couldn’t wait to get home from the office and check her out with her goslings. There was only one little fella that would give me the pleasure of popping his little head up …. The rest she kept closely concealed. The following day, after hatching, is when she should coax them from the bale and take them to the closest water source. This crazy goose has me so mesmerized that I set the alarm for 4:30 this morning to be the first to witness this amazing event. But there she sat, snuggled down with her goslings … not looking like she meant to go anywhere. Chores got underway and a couple hours passed. I went to check again, camera and binoculars strung about my shoulders and my worst nightmare….nobody was on the bale! I was feeling pretty disappointed that I had missed this “little show from nature” and then as I started heading back to the yard I saw a sight that completely devastated me….a pair of adult Canada Geese in the slough and no babies. Not again you two….why can you never succeed at this family-making thing? Why does that coyote or that hawk always win…year after year? We tried so hard to make conditions perfect for you and here we go again! I decided I better get a picture of the empty bale so I could illustrate this sadness, but this time I walked instead of taking the quad. 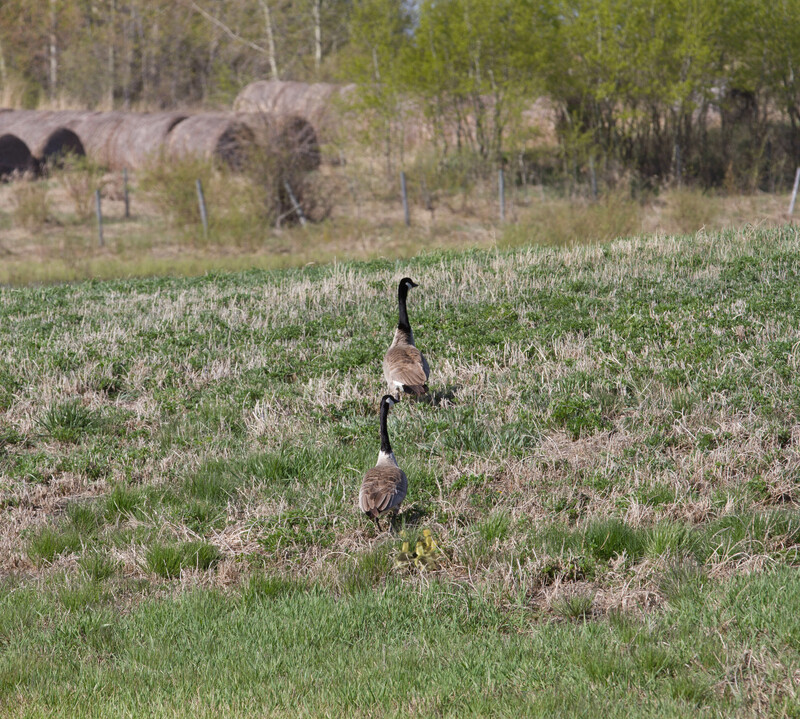 I walked dejectedly along too, when all of sudden, right there in front of me was the sweetest sight to behold….our goose pair with their entire family of seven goslings being guided to the southern most slough in the other direction! They, happily, had me fooled. Finally, after five years of trying, trying, trying….our faithful pair of Canada Geese has their first family. The Lucky Sevens I call them. They are now as safe as they can be in their water-sourced home in our south field. We can count on them to continue to return here annually. You can bet we will have the bale condos set up and ready for them smack in the middle of this pond so the dangerous waddle in the field can be eliminated altogether. Oh, and that pair I saw earlier? We figure they are a newly-matched Mr and Mrs who we anticipate will occupy the second bale which we will also set up in this pond. The more the merrier!! !